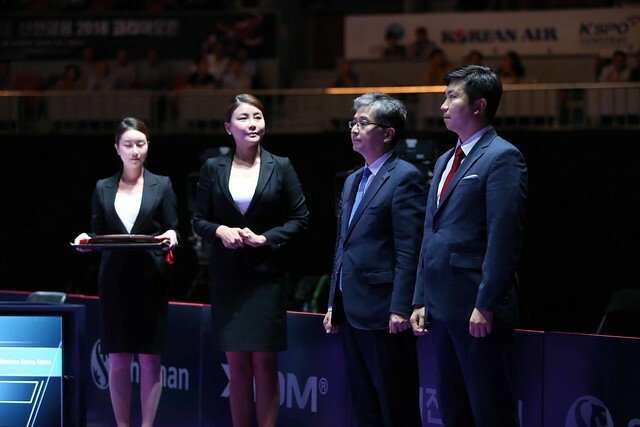 Defensive artistry evident as play commenced in the opening round of the Women’s Singles event at the Seamaster 2018 ITTF World Tour Platinum Shinhan Korea Open in Daejeon on Thursday 19th July; it was the skills of Japan’s Honoka Hashimoto that attracted the attention. In the top half of the draw she was the player to cause the biggest upset and the one Japanese player to survive. Required to compete in the qualification stage, she accounted for China’s Chen Xingtong, the no.10 seed and the winner some eight months ago in mid-November in Sweden. Impressively Honoka Hashimoto emerged successful in five games (2-11, 11-8, 11-9, 15-13, 11-6); notably it was their first meeting in a world ranking event, Chen Xingtong being unable to adapt to the deft skills of her worthy adversary. Success for Honoka Hashimoto, for fellow defenders, colleague Hitomi Sato and Li Jie of the Netherlands, it was defeat. Li Jie was beaten China’s Liu Shiwen, the no.5 seed (11-8, 11-4, 11-5, 11-7), as status advised; conversely Hitomi Sato, the no.14 seed, suffered at the hands of Korea Republic qualifier Choi Hyojoo (12-10, 11-8, 11-9, 15-13, 11-6). An unexpected defeat for Hitomi Sato according to ranking but recent meetings suggest otherwise; in Chengdu in 2015, Hitomi Sato prevailed but since that date the verdict has always ended in favour of Choi Hyojoo. She won in 2016 in Linz, last year in the same round in Korea Republic and earlier this year in the Under 21 Women’s Singles event in Qatar. Impressive from Choi Hyojoo against Japanese opposition, it was the same from colleague, Jeon Jihee; she ended the hopes of Minami Ando (6-11, 14-12, 11-9, 11-5, 11-2). However, if one nation impressed as matters commenced, it was China. Alongside Liu Shiwen; Chen Meng, the top seed, beat colleague Li Jiayi (11-6, 11-5, 11-2, 11-3), Wang Manyu, the no.3 seed, accounted for Hong Kong’s Ng Wing Nam (3-11, 11-8, 11-2, 12-10, 11-9), Ding Ning, the no.12 seed, ended the hopes of Portugal’s Fu Yu (11-3, 11-4, 11-8, 9-11, 11-9). Meanwhile, in the one remaining first round Women’s Singles contest in the top half of the draw, it was success for Chinese Taipei’s Cheng I-Ching; she beat Japan’s 16 year old Miyu Nagasaki (11-5, 11-4, 4-11, 11-3, 11-9).